Leagues of Gothic Horror takes Triple Ace Games’ roleplaying game of globetrotting adventure and mystery, Leagues of Adventure: A Rip-Roaring Setting of Exploration and Derring Do into that melodramatic genre full of legends, ghosts, vampires, dark magic, great evils, sinister villains, and even romance—gothic horror! That supplement is further supported by a number of smaller books, each of which explores various aspects of the gothic horror genre in greater in order to bring them to life. The Guide to Mummies is one such volume, expanding upon the information upon certain monsters and threats presented in the night—and more! And just like other titles in the series, such as the Guide to Apparitions, the fact that it is written for use with the Ubiquity roleplaying system means that its contents works with other roleplaying games and settings which use those mechanics, such as Exile Game Studio’s Hollow Earth Expeditions and Clockwork Publishing’s Space: 1889. Given that our fascination with the Mummy really stems from the discovery and excavation of Tutankhamun’s tomb in the 1920s and Boris Karloff’s portrayal of Imhotep from the 1932 film, The Mummy—and exacerbated by the more recent 1999 remake—initially it seems slightly out of place to have the Mummy as a monster back in the ‘Mauve Decade’ of the 1890s, which is when Leagues of Adventure and Leagues of Gothic Horror is set. Yet fascination with the Mummy dates to even earlier, with French and British archaeologists finding and excavating tombs throughout the nineteenth century as their nations’ imperial interests extended to Egypt and the recovered artefacts and Mummies being brought back to Europe for display. Further, both Bram Stoker and Conan Doyle wrote stories featuring Mummies—The Jewel of Seven Stars and Lot no. 249 respectively—during or close to this period. So if Leagues of Horror can do vampires, werewolves, ghosts, and more, then why not the not so humble Mummy? Now from the outset, it should be no surprise that the Guide to Mummies focuses on the Egyptian Mummy, since that monster is essentially what we think of first when it comes to Mummies. It examines their origins in Ancient Egypt, their embalming process, animal Mummies, and the misuse of Mummies for medicinal and other purposes. In terms of game design, it suggests and examines various origins—accidents, curses, magic, and so on—and when you combine this with the list of Mummy motivations such as duty, love, power, and revenge, then the Game Master has a readymade ‘big bad’ generator. They should also provide the basis for the research needed by the globetrotters—the player characters—in order to identify any Mummy antagonist and how to protect themselves from it or destroy it. The various new magical texts given in the supplement, such as Egyptian Magic and The Imhotep Papyrus, may also provide further clues. Mummies also need tombs. Locating them is also a matter of research, but designing them is the Game Master’s task. The Guide to Mummies gives a guide to their design, including their size, traps—descending stone blocks, pits of spikes, volleys of darts, and so on, and of course, and of course, curses to trigger by a tomb being excavated. So Raiders of the Lost Ark or the Curse of King Tut—take your pick! A selection of Mummy related relics can be used to provide further clues, serve as objects to be found in such tombs or with the Mummies, or serve as MacGuffins. As to their design, the Guide to Mummies divides Mummies into Greater and Lesser types. The latter are mostly unintelligent servants, the former actually intelligent, whether as supernatural masterminds or servant to some other mastermind. Their form can be skeletal, preserved, incorruptible, or even flesh and blood, but all Mummies have the advantages of not needing to eat, drink, or sleep, not feeling pain, and cannot be stunned. Beyond this, for each Level of the Patron advantage, a Mummy can have an extra Power, such as Body of Dust, Crush, Mesmerise, or Phylactery, to individualise the Mummy. Of course, the Game Master need not go to such lengths, as the Guide to Mummies provides plenty of examples to use as threats and villains. Although the supplement has mentioned Mummies from South America and Europe—the latter the Bog Bodies, the primary focus of the Guide to Mummies to this point has been the Egyptian Mummy. Here it includes the frozen Mummy as well as the Warrior, the Crusher, the Shambling Corpse, and others. Stats and write-ups for Egyptian threats typical to the genre, animated statues, cobras, are also given, including flesh-eating scarab swarms, for the Game Master who wants to emulate a certain film. To ensure that Mummies do not grow stale, the supplement includes an short essay on making both them and their motivations interesting and thus memorable. The principles are applied to the ten or so major villains and NPCs. These include Aristeides, a former librarian at the Library of Alexandria and fanatical bibliophile who seeks to recover all of the library’s lost works; Rupert Stafford, mediocre archaeologist whose famed discoveries came hand-in-hand with membership of a cult dedicated to He Who Will Arise; and Eztli, an Aztec Mummy released in London who now enjoys a life of frivolity and gaiety, but must feed on a mortal once a month to retain her beauty! These ten or so, in some cases including associated cults, are a ready selection of villains and NPCs around which a Game Master build a scenario or two. After all, Mummies have been known to return! Physically, the Guide to Mummies is decently written and presented, although some of the artwork is somewhat scratchy. It is short enough to not need an index, although the inclusion of a proper bibliography would not have gone amiss. 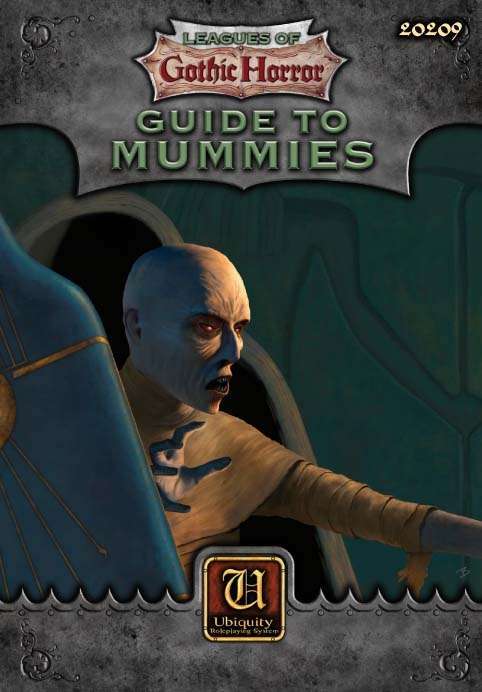 Like other entries in this series, the Guide to Mummies feels a little concise in places, but it gets a lot of mileage out of its subject matter and presents ideas and hooks aplenty with which a Game Master can create scenarios and threats. There is content here suitable for any pulp horror roleplaying game, not just the Leagues of Gothic Horror setting, but this greatly expands information about Mummy and enables the Game Master have this monster return again and again to his campaign.